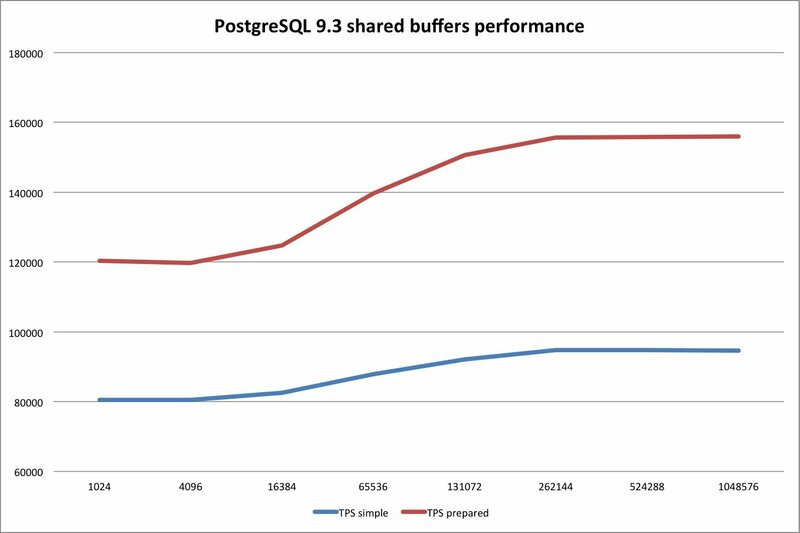 A lot has been said about PostgreSQL shared buffers and performance. As my new desktop box has arrived this week I decided to give it a try and see, how a simple benchmark performs, given various settings of shared_buffers. The test box we are running on is an AMD FX-8350 (8 cores) with 16 GB of RAM and a 256 GB Samsung 840 SSD. The goal of the test is to see if the amount of shared memory does have an impact on the performance of the system. NOTE: In our test the benchmarking program is running on the same node sucking up around 1.5 CPU cores. So, the tests we have here can basically just use up the remaining 6.5 cores. While this does not give performance data, it is still enough to see, which impact changing the size of the shared buffers have. It is interesting to see that the impact of not having to ask the operating system for each and every block is actually quite significant. The same can be said about prepared queries. Avoiding parsing does have a serious impact on performance – especially on short reading transactions. Close to 160k reads to find data in 10 mio rows is actually quite a lot given the fact that we are talking about hardware, which is ways around 1.000 euros including VAT.